The average fee is the average payment influencers want to be paid to post sponsored stories across their channels. 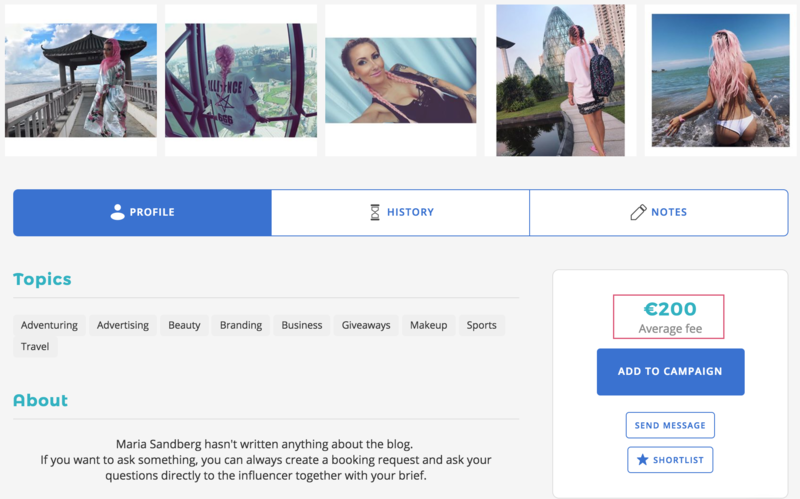 When you browse or search for influencers, the fee will be displayed in the bottom left-hand corner for each influencer. Note: the average fee will be shown in the display currency that you have selected. The influencers' average fees will be visible to you when you search for influencers and make booking requests. When creating a booking request, you set a budget for the booking depending on the scope of the project. You can set the budget both higher and lower than the influencer's average fee. The influencer will then decide whether the budget is adequate or inadequate, and may negotiate the budget that you have offered. The influencer can also choose to decline the booking request received.